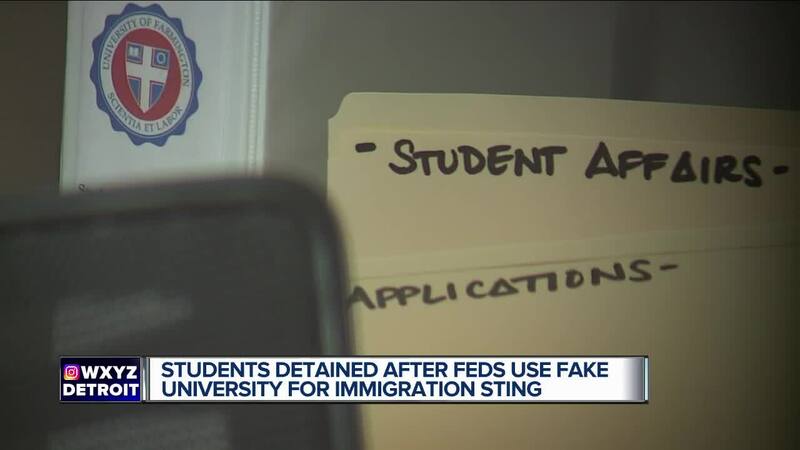 FARMINGTON HILLS, Mich. (WXYZ) — Federal investigators say they created a fake university in Farmington Hills as they carried out an immigration sting. They say it busted people breaking the law. Witnesses say it also destroyed innocent lives. The name of the “school” was The University of Farmington. Investigators say it had no instructors or classes. It was made up by undercover Homeland Security agents. The investigation started in February 2017. For almost two years, a federal indictment says investigators worked with people who offered to recruit students to “pay to stay.” They would enroll in school for immigration papers. Those eight people are now charged with conspiracy. Plus, about 130 students were detained and are facing possible deportation. Amer Zahr, a Professor of Law at the University of Detroit Mercy, is the family spokesperson for Najilaa Musarsa, one of the students from Dearborn Heights now locked in federal detention in Calhoun County. Her family says she honestly wanted to go to college. “It seems the government was really involved in tricking students into violating the terms of their visas,” Zahr said. The government says everyone who paid tuition knew what they were doing, that they were illegally paying to stay, not attend school. People who work in the building where the university was located contradict that. She says students always were trying to find out information about the school, and claiming they were struggling to get a hold of people. Steven Jeffers said some came with backpacks, asking about classes. Russell Abrutyn, an attorney who has spoken to several detained "students," says the government took money from innocent people under false pretenses. WXYZ contacted the feds to ask questions about processes in place to make sure the “University of Farmington” wasn’t taking money from people who just wanted an education. We were told because of the ongoing investigation they could not comment.